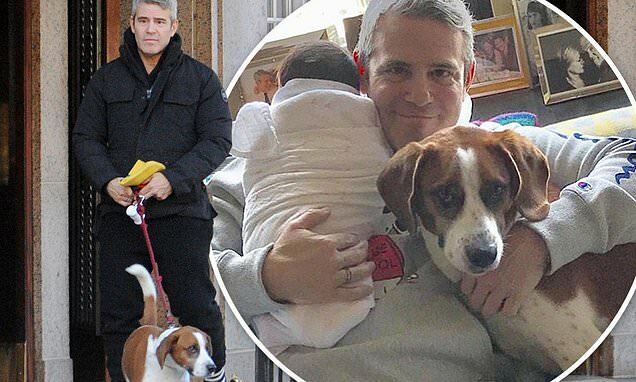 Andy Cohen celebrated a very special Valentine's Day with the loves of his life - his new baby boy Benjamin and his beloved dog Wacha. The newborn, who arrived via surrogate on February 4, was swaddled in a warm white blanket while Andy wrapped his arm around the rescued animal. The Bravo boss also shared a glimpse inside Benjamin's nursery in a picture posted on Wacha's official Instagram page. 'Checking out my little brother,' the caption read, alongside a photo that showed the dog peeping into the baby's crib. Andy also carved out some time for exercise on Thursday morning. He rocked a warm black coat with a hood keeping the back of his neck warm as he went on the brief walk. His buttoned-up coat was worn with a black sweater and matching track pants with white striped cuffs around his ankles. The Real Housewives connoisseur wore a pair of grey-and-black trainers as he left his building in search of some grass for his beloved dog.